With visible fat removed, a 3.5 ounce serving of buffalo is just over 2 grams of fat, for virtually all cuts of the meat. (Not so ground buffalo or buffalo burgers, which are higher in fat.) Of the lean cuts of beef, 3.5 oz of flank steak are 8.0 grams, bottom round 9.4, top sirloin 7.9, T-bone steak 10.3. This is a major virtue to someone like me who sometimes wants to eat red meat. Buffalo used to be more expensive than beef, but with the rising cost of beef, the relative cost of buffalo is now competitive to the price of good quality beef. No, they are not endangered! A mix of grillable vegetables. I used 16 medium mushrooms, 2 zucchini, 1 red pepper, 1 yellow pepper, and a medium onion. You could also substitute eggplant for one of the vegetables. This amount will give you enough for an extra skewer of grilled vegetables. Mix marinade ingredients in a small bowl. Cut buffalo meat up into 16 approximately even cubes (this will give you 4 cubes/skewer). Place buffalo cubes and marinade into a quart-size zip top plastic bag and zip closed. Mush around so that the meat is completely covered. Place in the refrigerator and marinate for 2-4 hours, turning occasionally. Cut vegetables into chunks – mushrooms whole, peppers into about 12 pieces, onion into eighths, zucchini or eggplant into 1 or 2 inch thick pieces. String meat and vegetables alternately onto skewers, 4 chunks of meat and as many vegetables as you can fit on a skewer. Grill over medium heat for about 6 minutes per side, or until done to your liking. About 5 grams of fat/skewer. My kebabs got a little too well done for my taste, because it was well after dark when we started grilling , and my motion sensitive outside light didn’t seem to think that grilling created enough motion. Grilling by flashlight is not the greatest idea. But they were still very tasty. I got this recipe from the blog of Coconut and Lime, a wonderfully inspirational source of original recipes. 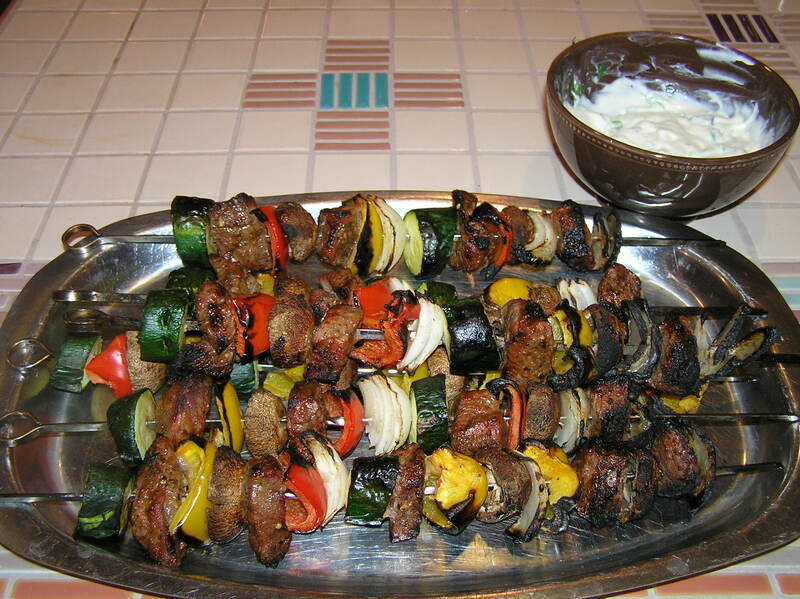 I was trying to find something to go with the kebabs that would taste good with the grilled vegetables, but wouldn’t take hours to make (it was, after all, already past 9 p.m. when I hauled the marinated buffalo cubes out of the refrigerator and we were starving). I also had an excess of green onions and I never tasted a grilled green onion. Grill onions by placing them on a grill over medium heat, 3 minutes to a side. You could grill the onions at the same time as the kebabs, but, as I have pointed out, it was dark, and I decided to deal with only one thing grilling at a time. Chop the green parts of the onions coarsely – the white part made a tasty snack as I continued to cook. Whisk together the sour cream, mayonnaise, yogurt, Worcestershire sauce, salt and pepper. Mix the chopped green onion into the sour cream mixture and serve with the kebabs. 1/4 of this sauce has about 1 gram of fat.